It's been a week since I last posted and would you believe that all I have worked on is this sweater? It's taken an extraordinary amount of time. It doesn't look very long here, but to give some perspective, that ribbing at the bottom is 5 1/2 inches. The rest is solid knitting and purling. It's the purling that always slows me down. That being said though, I love this pattern so far. I did change the back from a lace design to solid for warmth. I still have to knit about 6 inches around both fronts and neck. Then sleeves and pockets. I won't finish anytime soon. Admittedly, I didn't knit much over the weekend and have been busy a lot this week, so I haven't knitted as much as usual. I am enjoying it though, and can see myself making another if the pattern continues to go so smoothly. Tomorrow it will be three weeks since these carnations were bought at Trader Joes. I can't believe how long their flowers last. 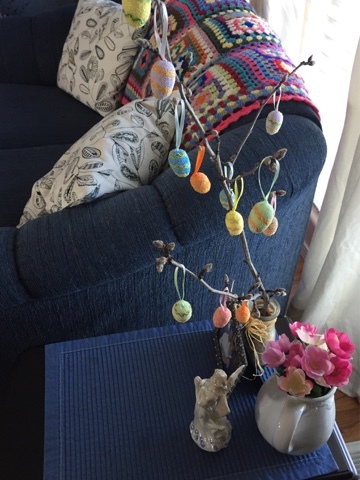 My little Easter tree. It makes me happy. Did I show you this last time? Sorry about the glare, I am most definitely NOT a photographer and don't pretend to be. 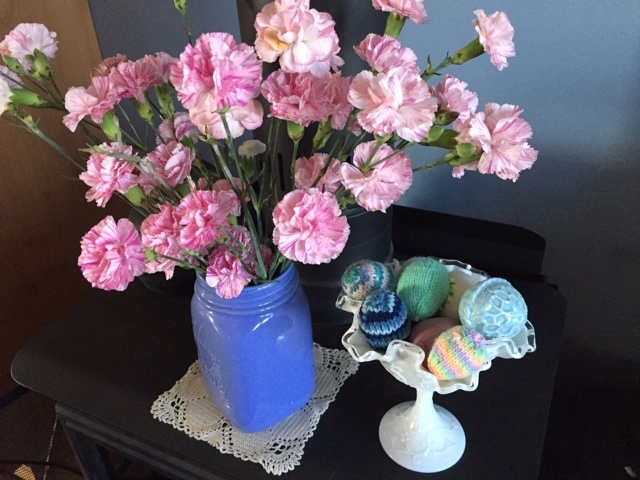 I crocheted these flowers a few years ago and they spend a lot of time on the island in the spring and summer. 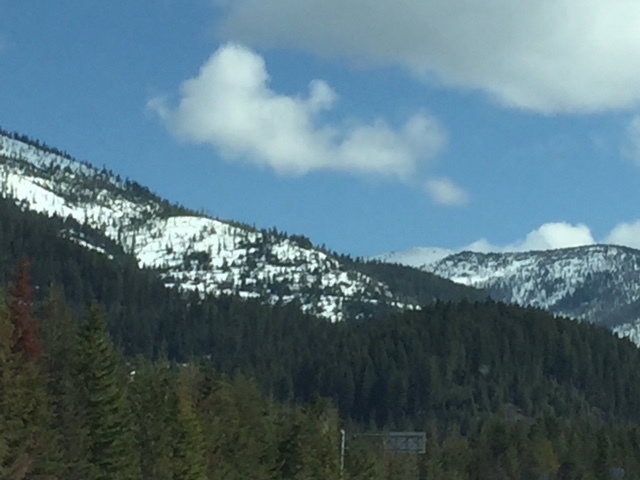 As you may remember, we drove to Missoula, MT last Friday to spend the weekend with our son and grandchildren. 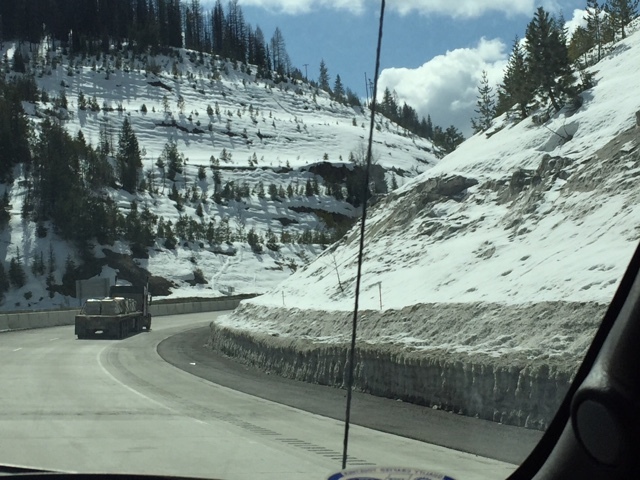 This was our absolutely gorgeous drive there through two mountain passes. It's a three hour drive for us and one and a half hours for Jamie and the kids. 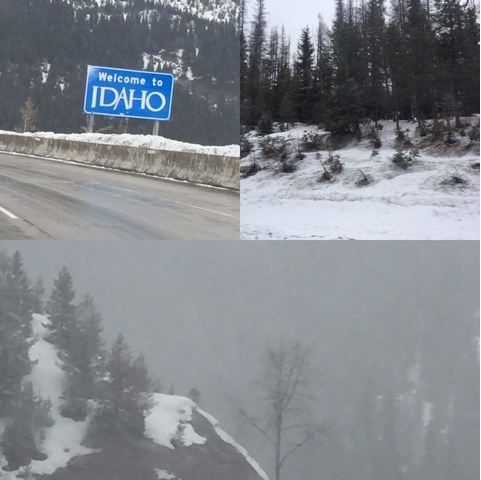 In that three hours we're in three states, Washington, Idaho and Montana. Up, up, up we go. 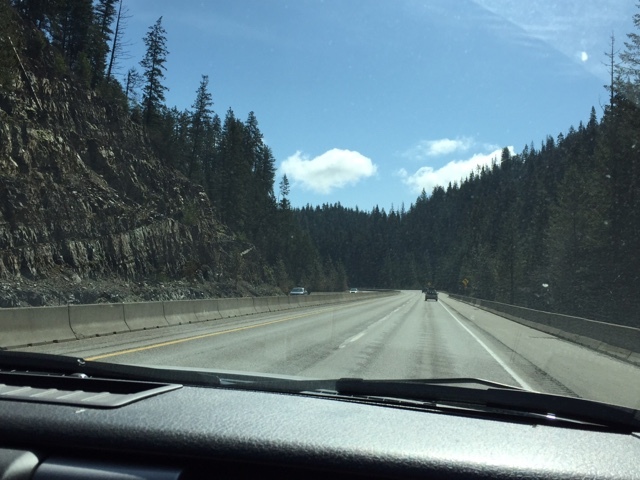 It was SUCH a beautiful drive that day. The snow is still fairly deep up there. This photo was close to the bottom of the pass. Then, after a short drive through the valley we headed up Lookout Pass. 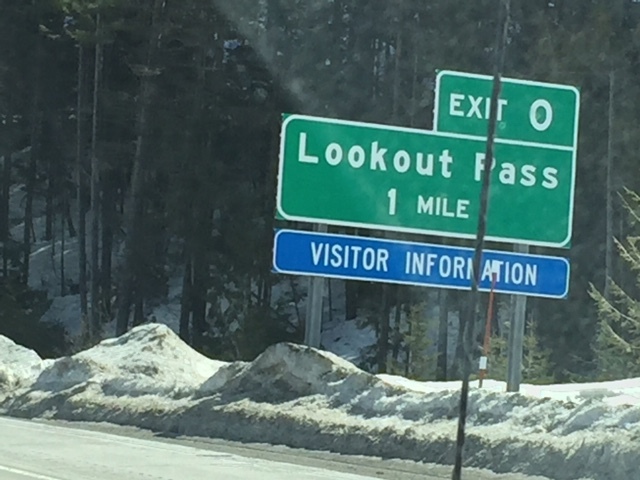 At the very top is exit 0, the state line of Montana. Did you know that on the west side of the continental divide the rivers flow west toward the Pacific and on the east side, they flow south and east? When we first moved here it was so strange to me. It seemed as if the rivers were all flowing backwards. It's really very disconcerting. Now I'm used to it, and when we go home to Nebraska, it seems to me that those rivers are flowing backwards! Now, on the way home, things changed drastically. It was 59 degrees in Missoula and I was in flip-flops. As we started up the pass, this is what we found. Snow. Lots and lots and lots of snow falling. The temperature dropped to 15 degrees. I'm sure glad I didn't have to walk in my choice of shoes! I also always keep a crocheted afghan in each car. That came in handy too. Thankfully, although it was piling up next to the road, nothing was sticking on the highway yet. 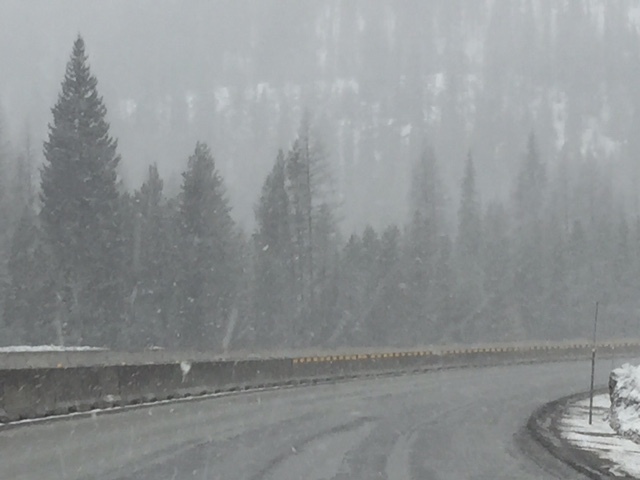 A co-worker of Dennis' drove through the pass about 2 hours later and had to stop and chain up. It was good we left for home when we did as we didn't take chains with us! 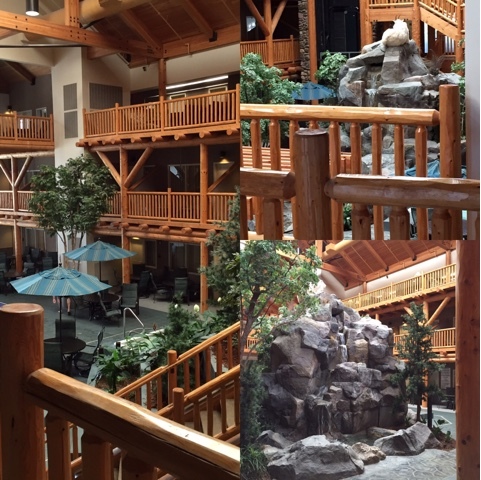 This is the inside of the hotel we stayed at. The kids, (and adults), just love it. Two swimming pools, 5 hot tubs, ping pong tables and an amazingly huge breakfast. Every thing is centered around this courtyard with a waterfall. You can see it from every room. We really enjoy this place. 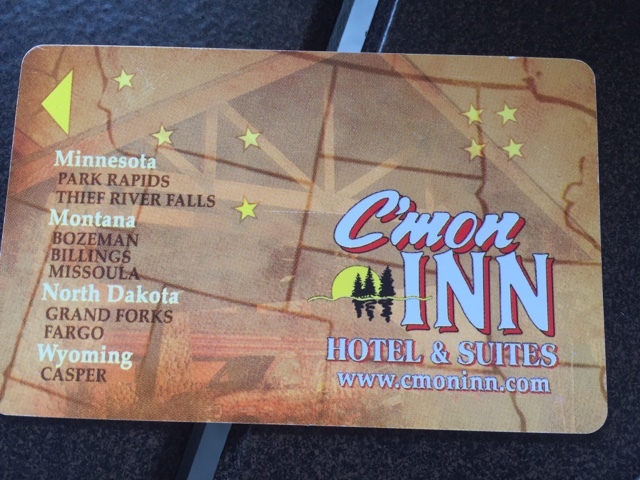 Here's a picture of our keycard so you can see if there is a location near you. 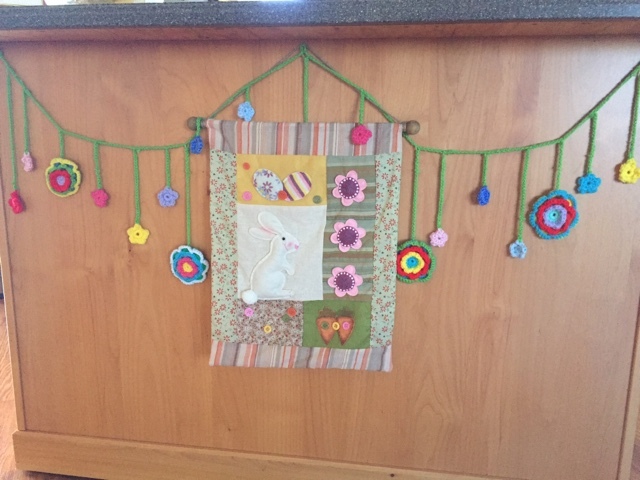 It is a wonderful place to go for a night away, especially if you have children. The employees have always been super helpful and nice. AND, you get warm chocolate chip cookies when you check in. Coffee and hot tea are in the courtyard 24 hours. We really like it here and have stayed 3-4 times now as the price is extremely reasonable. 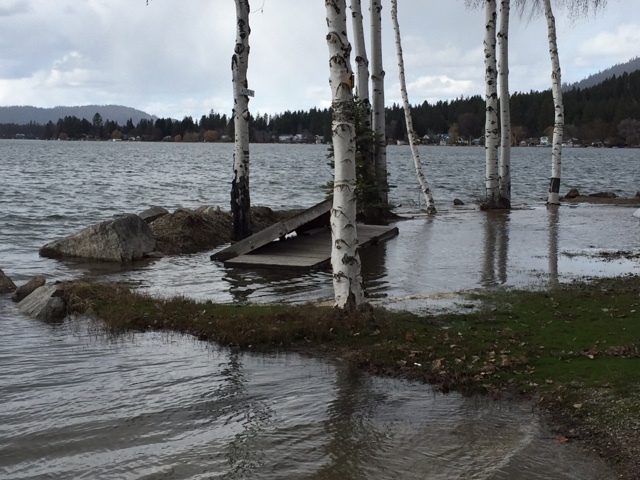 When we got home, we had an email from the management at the lake that there was flooding happening. Although we knew there was absolutely no danger to our trailer since we're up on a hill, we drove up to take a look for ourselves. We have never, ever seen the lake even close to being this high. 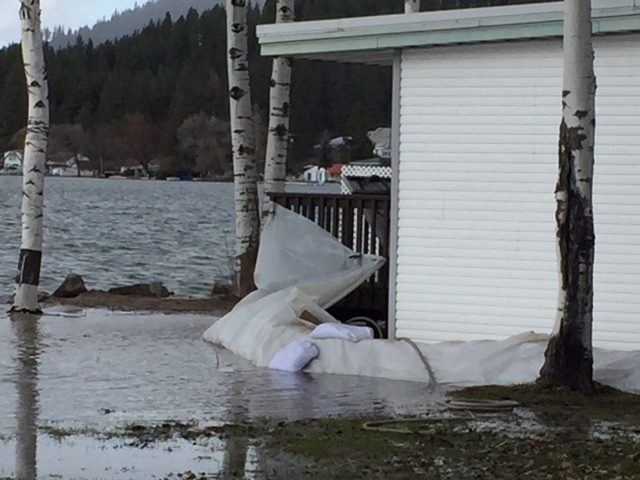 This cabin is normally about 25-30 feet from the lake and they have had to sandbag several others besides this one. These trees and rocks are usually on high ground far from the water. This is normally where I walk every day. Some trailers closer to the lake are threatened by water and lots of homes around the lake have basements full of water and it's up to their front doors. Many of these people are year-round residents. It's sure been a crazy spring. I hope you are all having a lovely day and enjoying a lovely spring. This verse has really caused me to stop and think. It was in a devotion I read a little over a week ago. I's important to set priorities on who we are trying to please/impress in this life. My goal is to live my life based on Jesus and not on the whims of this world. Who are you trying to please? Just a thought that I've been thinking about a lot lately. Oh that water level would worry me. I hope friends are safe. Love the approval prompt ...Im not to worried about impressing folks in general....but I do want to work a bit harder at GIVING approval to those who seem to need it. That's wonderful Kathy! I agree. I've seen the motel in Casper, WY, but I don't know anyone who has stayed there. Good job on he sweater! Oh, wow...so much to comment on in this post. Snow! Hotel! River! Wow. That hotel looks so nice and you were able to visit with family. I hope there isn't too much damage at the lake. 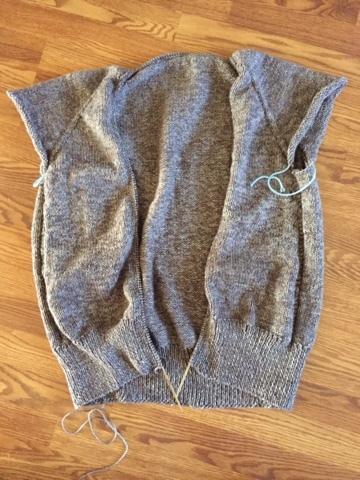 Another great post Betsy, your cardy is coming along nicely, don't know why but I imagine cable in two front with pockets knitted in, perhaps cos my mum like that style to knit, she loved cables. Great time with family and such a blessing indeed you were well enough to go and whilst away blessed and and kept safe.
" He must increase, I must decrease"
.. our goal should be, as Peter said, to "Grow in grace and in the knowledge of our Lord and Saviour, Jesus, Christ..." thanks for being a blessing sis. Adventures right and left of you! Thanks for the scripture encouragement; always a good question to keep checks on our motives. Look at your sweater! Wow! The fastest knitter in the West! What pattern is it? Thank you so much for the pictures as with my fear of heights I will probably never make it out West and I love mountains...go figure!?! That hotel looks really nice and I like the coffee and tea 24 hours and warm chocolate chip cookies! Your sweater is so nice. As one comment said ...cable...I like cables as well. Would look nice on that sweater. I knit a sweater for 4-H years ago that had cable front, back and sleeves. Wish I could still wear it. I thankful you and Dennis had a good visit with your son and grandchildren. Nice hotel too. I aim to please God, not mankind. But I tend to be nice to everyone I meet to make them happy too. When we step out and help people in their need, it's in Jesus name that we do it. Interesting fact about the rivers. I'm not sure I knew that. I do now!!! ;'} Have a blessed Sunday and hope you are feeling better! Hugs my sweet friend! I hope the weather stays more agreeable for you now, Betsy. That looks like a lot of snow. Your sweater is looking great. I can't believe all the detail and intricate design aspects you're putting in, such a talented knitter. Your visit with the kids sounds wonderful. You've shown that hotel before and it really sounds like an amazing place to stay. So glad you all had a good time together. I hope you're having a good week so far! Oh, it always such a blessing to see your post in my inbox! I love coming by to visit with you, sweet friend. So thankful you had a wonderful trip away. That is so amazing how the weather changes so quickly in such a short distance! I think it is a great idea to keep an afghan in each vehicle. It is always a good idea to be prepared. The sweater you are making is just beautiful! I hope your pain is much better now and trust you are having a lovely day! God bless you!! Glad you had a safe and enjoyable trip. God bless! Looks like a chilly but fun trip! That hotel is amazing. Have a blessed Easter!